(Phys.org) —A team of physicists working at Oxford University in the UK has found that it's possible to use some types of perovskite as a replacement for thin film silicon cells using the same basic processing technique and still get power efficiencies of 15 percent. In their paper published in the journal Nature, the researchers report that they have discovered that using a bubble-like nanostructure, or an insulating scaffold to create thin film solar cells is unnecessary—the new kind of cell is able to serve as a semiconductor on its own. Impressed by the advancements made by the research team at Oxford, Michael McGehee of Stanford University has published a News & Views commentary in the same journal describing the new work and the likelihood that perovskite might supplant silicon as the basis for most solar cells. As most people are aware, modern solar cells are based on silicon—a cheap and abundant semiconductor. Unfortunately, because the efficiency rates of silicon based cells are still relatively low, the cost to produce electricity using them is still relatively high. 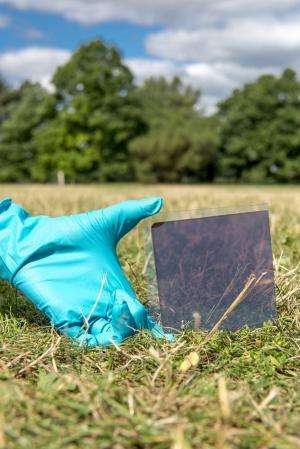 For that reason, scientists have tried making what are known as thin-film solar cells using inexpensive substrates—but such cells have been prone to defects which has limited their popularity. That has led scientists to wonder if other types of thin film cells could be made using a material other than silicon. One group that appears promising are organometal trihalide perovskite semiconductors. 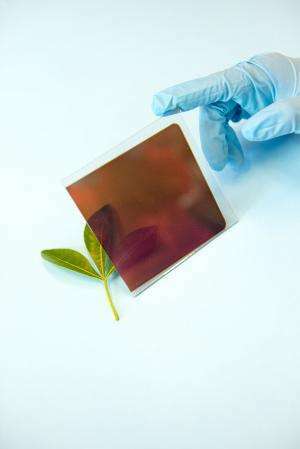 Solar cells using different types of perovskite made their debut just four years ago and since that time have been made more and more efficient. Initially they were used as a dye replacement to act as light absorbers—complex bubble-like nanostructures were built for them under the assumption that they would be poor charge carries. Then, last year a team at Oxford found that insulating scaffolding could be used instead of the complex nanostructures. In this new effort, the researchers have found that neither is necessary, as perovskite is able to carry the charge itself—while still offering 15 percent efficiency. This breakthrough, McGehee suggests, could mean the end of silicon based solar cells in favor of those based on perovskite provided two things happen. The first is that researchers find a perovskite that doesn't have lead or other toxic elements in it that can leach out during or after use. 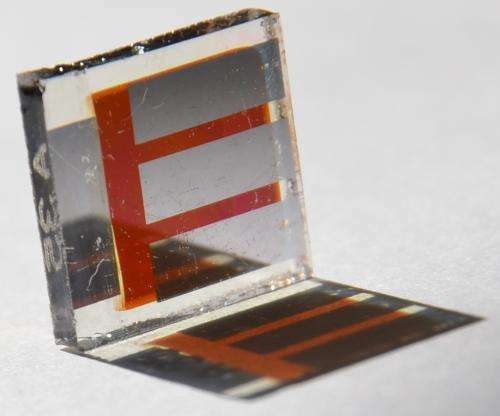 The second is that a way can be found to make perovskites as durable as silicon—recent tests have suggested that because they are water-soluble, they won't last as long as silicon, which has proven to be stable for decades. Many different photovoltaic technologies are being developed for large-scale solar energy conversion. The wafer-based first-generation photovoltaic devices have been followed by thin-film solid semiconductor absorber layers sandwiched between two charge-selective contacts3 and nanostructured (or mesostructured) solar cells that rely on a distributed heterojunction to generate charge and to transport positive and negative charges in spatially separated phases4, 5, 6. Although many materials have been used in nanostructured devices, the goal of attaining high-efficiency thin-film solar cells in such a way has yet to be achieved7. Organometal halide perovskites have recently emerged as a promising material for high-efficiency nanostructured devices. Here we show that nanostructuring is not necessary to achieve high efficiencies with this material: a simple planar heterojunction solar cell incorporating vapour-deposited perovskite as the absorbing layer can have solar-to-electrical power conversion efficiencies of over 15 per cent (as measured under simulated full sunlight). This demonstrates that perovskite absorbers can function at the highest efficiencies in simplified device architectures, without the need for complex nanostructures. What seems to be water soluble is the thin ionic template/adhesion layer required for the perovskite to form a nice film. That's where the lead is too. The use two adjacent evaporative sources to create that layer, one being lead dichloride and the other monomethyl ammonium iodide.